I have titled this Calavera: 'Share the Road'. It is a tribute to all the cyclists who have been killed riding their bikes in the city. I created this piece specifically for the 'Muertos' show at Redux and it can still be seen there until Nov. 30th. It started with picking up bits of broken reflector in the street and feeling that each broken shard had a story to tell. I took the opportunity of being involved in this show to create something that I hoped would convey a message, it was a bit of a departure for me. I tried to keep it pretty -in the 'sugar skull' tradition, but I also let it bleed. For the most part, I enjoy art because it makes me feel good, but sometimes I get even more out of it when it makes me angry. I felt it was important to make something that might stir an emotional reaction and make others angry too. In my own little way, I hope to inspire an awareness: to SEE cyclists on the road, be courteous and drive safe (STOP driving over them!) -it's a matter of life and death! El Hueso doesn't like this piece. He was instantly put off by the gory aspect. He had been enjoying my quirky little Calaveras until this one crossed the line. It's true that my work has been mostly lighthearted, decorative little musings meant to bring a smile and ease our fear. Let it be known, it is NOT my intention to glorify death or wallow in the dark side. My folks for example don't really get what I am doing, it just doesn't appeal to them at all. I understand that not everyone wants a skull on their wall! I know that death is a loaded subject and the last thing I want to do is offend anyone. But kids on the other hand, are totally drawn to my stuff. They don't have the baggage attached, they just think skulls are cool! Perhaps it's a generational thing. I want to know what you think. Be honest, be forthcoming, I'd love to hear your feedback. i really love this piece Alea and am so glad you shared the story behind it. I have always been a huge fan of mexican folk art dealing with dia de los muertos, of which your calaveras really remind me of it, so I'm a fun skull lovin' type of gal. But bravo on some great work! I think it's important to speak truth and that's an important thing to be aware of in this bike-dense town. I am always humbled by "ghost-bikes" when I see them, and am by your piece. Thank you. 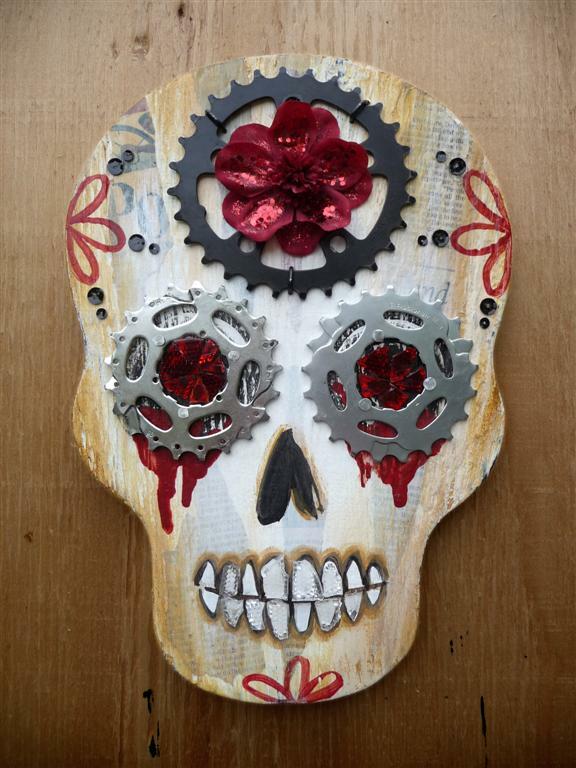 Your calaveras are an enticing mixture of whimsy, celebration and death. When I see your decorative skulls I feel both light-hearted and somber. For me, ultimately they speak to the celebration of both life and death. Good work, Alea. I followed a link from BikePortland, and I have to say I love the piece. The flowers made from the broken reflectors and the cogs in the eye sockets and everything are just wonderful. How much and when could I buy it? or is it already sold?